Interior styling relies on cushions, they’re the “pink lipstick of the room” . They are also incredibly versatile and are the easiest ways to get the satisfaction of re-decorating without the hassle. 1. Look for florals or other prints that will coordinate with colours you may already be using in your home and balance strong prints with plenty of neutral surfaces. Do you have an favourite artwork or rug in you room which you can tie in key colours for new cushions? Yvette from the Stylist Splash has styled her outdoor pool room using a variety of textures and patterns which tie in with her artwork. 2. If you have a neutral colour theme in your living room, select two or three bold colours to inject a little depth into the space. The more neutral your room, the brighter your cushions can be. Rebecca from Victoria Park Freerange has chosen a colour palette of blues and greens with a hint of orange and pink to add a little pop if brightness. 3. Don’t be afraid to combine multiple textures from velvet to silk to fur; combining heavy textures with lighter ones across your cushions will keep your home looking cosy yet modern. 4. When looking to update your room, take inspiration from a range of sources. If you love the colours and print in your favourite silk scarf, then use that as inspiration when looking for beautiful prints on cushions. 5. 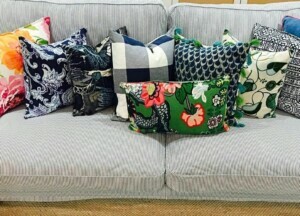 Have all your cushions in the same regimented size can look very formal. Combine cushions of different sizes and shapes such as oval or oblong to create a more homely and welcoming look. 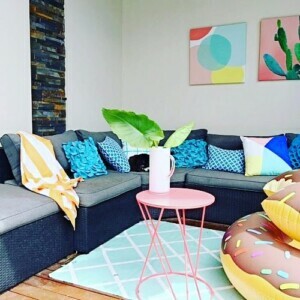 When choosing cushions not only is it great to mix up prints and colours but sizes too as Olga from WA has done in her outdoor room. 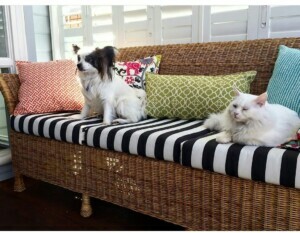 Most of our cushions are available in 4 great sizes. 6. You can still have a gender neutral room with cushions – grey and yellow is a great combination that lifts and living space without being overly feminine. 7. Contrast block colours with horizontal lines and vertical lines in narrow spaces to play with the eyes. House and Garden Magazine have used our square Blue Ikat Spot Indoor Outdoor Cushion in this bedroom. Teamed with other cushions in neutral colours, various shapes and textures (velvet) adds to the relaxed coastal bedroom vibe created by the stylist. 8. If your home consists of earthy, neutral colors, add some metallic to maintain a textured and edgy finish. Keep it chic and simple, and stick to the monochrome for a sophisticated edge. 9. Use a ‘karate chop’ in the middle of the cushion to create a crease in them – this will make them seem more lived in and loved. It will also help to break up uniform shapes, and unite cushions of different colours, scales or families. This works particularly well for indoors when using duck feather inserts. 10. Try changing the orientation of your existing cushions to give a room a new feel. I’d love some styling advice! I have a greyish rattan outdoor sofa with beige seat and back cushions. I’d like 2-3 decorative cushions on each that tap into a Moroccan type style. We have some navy and white floor cushions and some red and orange in our outdoor dining space, so they would need to complement these. You have several designs that I really like but I find it so hard to picture how it will all go together. I’d therefore love your advice on which styles and sizes would work well together.